Israeli Art Market #11 2015. 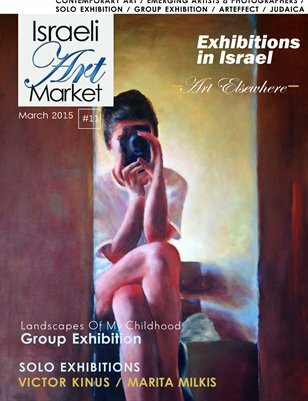 March Issue #11 I am pleased to present this month’s issue of Israeli art market’s Magazine. This month we present the Group exhibition “Landscapes of my childhood” which leads us to go back to the sense of small details from our past, like a flower, the look of a mother looking from the window, shape and color of a building and the street as it remains in our memory. As the quote of great artists Edgar Degas (1834- 1917): “Art is not what you see, but what you make others see.” these artis made us feel their memory of childhood. These colors, smell and small pieces of memory created us the meaning of home, background, routs. Pesach is on our door, and we soon start the biggest sale event, especially from our new category on the site: Special Art For Collectors. A Showcase of the known and emerging artists in Israel. Excellent pieces of art. With worldwide free shipping. So don't forget the visit us on our Israeli Art Market’s Site. I wish you pleasant reading and enjoyment.